Tonight I'm joining some of the Art with Heart Stampin' Up! Team girls in sharing some fun and fabulous ideas to inspire you from our brand new Holiday Catalogue available on September 1st until 2nd January 2018. If you don't have a copy and would like one, simply let me know and I will post one out to you. For my project, there was no question as to what I was going to use, it had to be the Quilted Christmas Suite. This is such a beautiful suite of products from the DSP to the fantastic Framelit dies and everything in between. 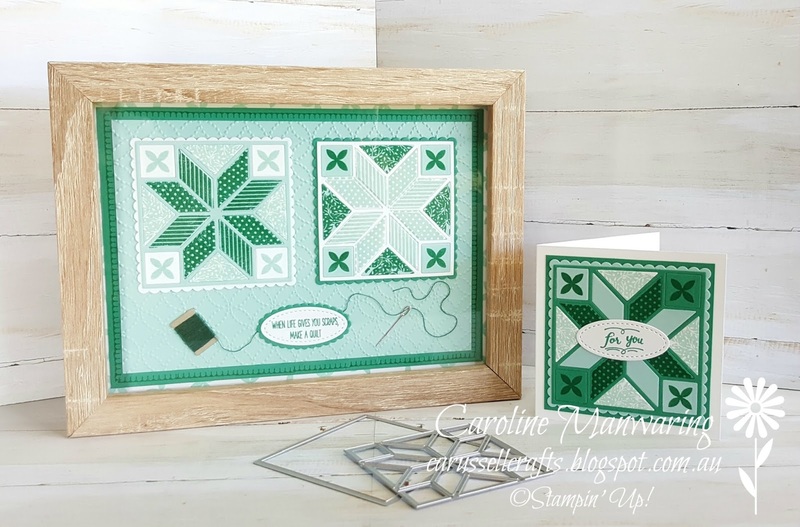 I have created this framed sampler and matching note card in the gorgeous colours of Emerald Envy, Pool Party and Whisper White. I started with a piece of Whisper White card stock which I stamped around the edge in Pool Party ink, using the 4 point petal stamp from the 'Christmas Quilt' stamp set. 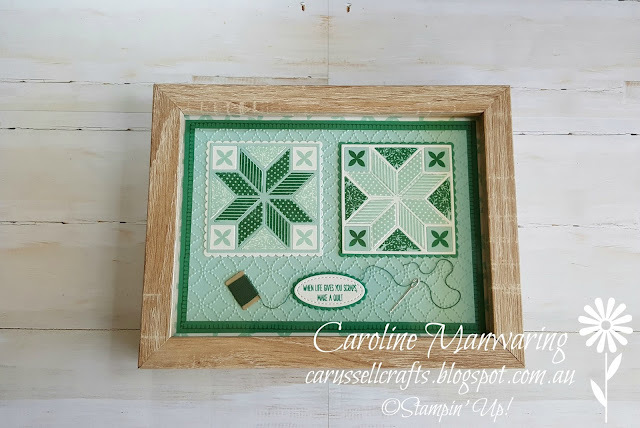 Next is a piece of Emerald Envy, and here I used the little blanket stitch stamp, and stamped all the way around the edge using Emerald Envy and then I embossed a piece of Pool Party using the Quilt Top TIEF. 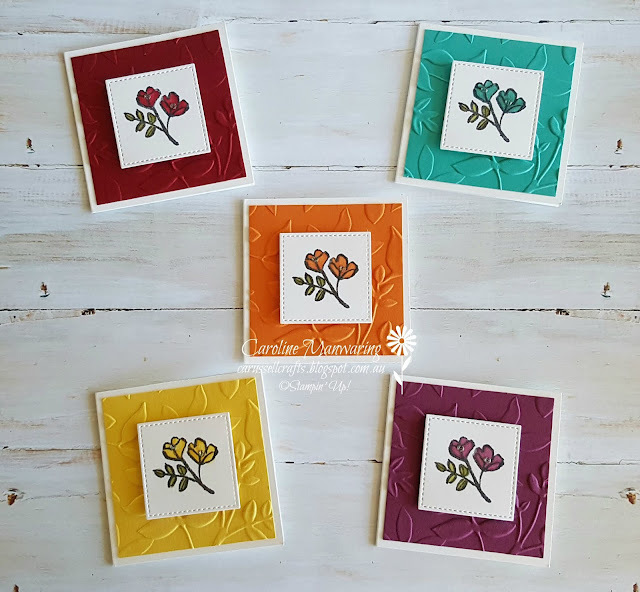 Now for the little quilt blocks, I used both Emerald Envy and Pool Party inks in each of them. The one on the left has a Pool Party outline frame and the one on the right has a Whisper White frame. Both have been backed with a Scalloped Layering Square Framelit. For the actual block, I cut a 3" piece of card stock and adhered a piece of our Multipurpose Adhesive Sheets to the back, before running it through the Big Shot. The use of the adhesive sheet made it so easy to put the blocks together, especially the frame as it is quite fine and flimsy to handle. The adhesive gives firmer pieces to work with. When stamping the star pieces for the blocks, I found it easier to ink up the stamp and then lay the pieces directly onto the stamp as the stamp is slightly larger than the die cut pieces. Unfortunately I realised after I had stamped the first block that this was the case, but easily managed if you apply my little tip. 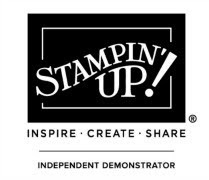 It's so much easier to see where you're stamping. 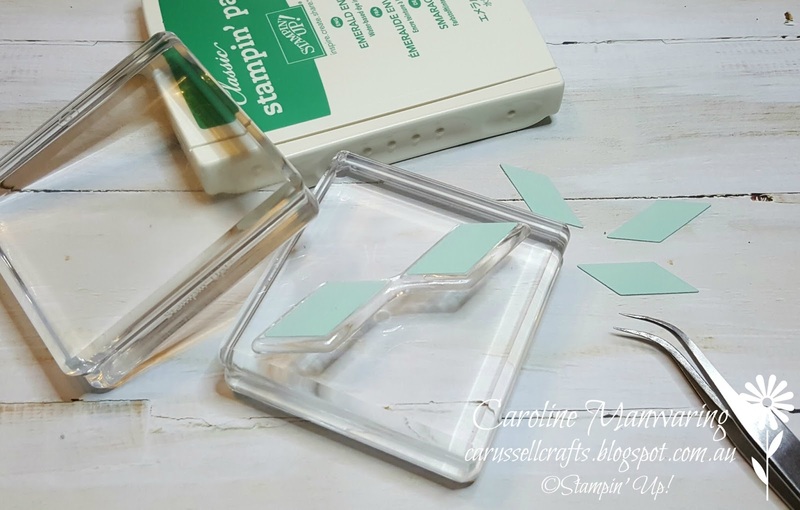 To get a good stamped impression, I use another acrylic block and press down over the top. 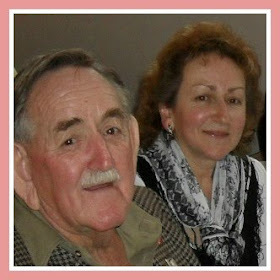 You can see what I mean in this photo below. I wrapped some embroidery thread around the little cotton reel, (I managed to find almost a perfect match for Emerald Envy), and threaded the needle - both of these are simply the cutest little dies in the Quilt Builder Framelit Dies set. The little sentiment "When life gives you scraps, make a quilt" is another stamp in the Christmas Quilt stamp set. 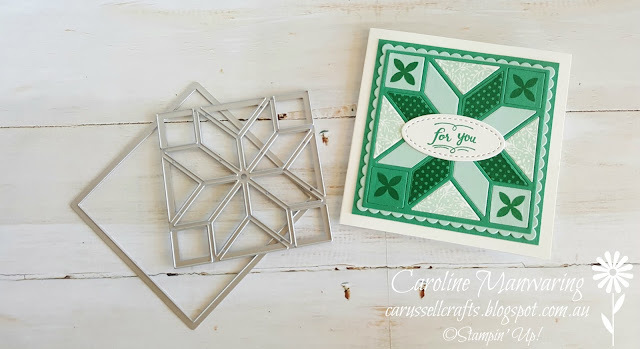 It is stamped in Emerald Envy and die cut with a Stitched Shape Oval and backed with a scalloped oval. I had so much fun making this project and I look forward to using this fabulous suite of products a lot more. Thanks for stopping by on your way through our hop, I hope you're enjoying all of the wonderful creations and feeling inspired. Now it's time to hop on over to our next participant, the very lovely and talented Catherine Proctor. 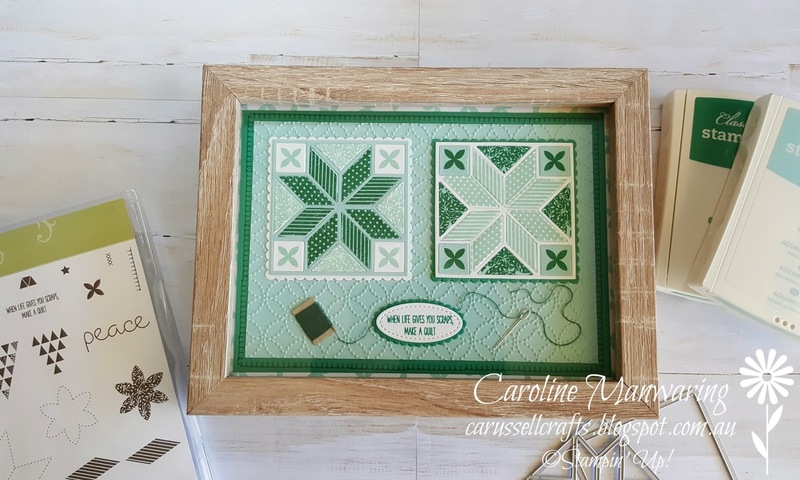 Oh, I LOVE the sampler you've made, Caroline ... it's gorgeous! What a beautiful colour combination. Your sampler is fabulous! The mix of greens is lovely. Oh wow Caroline, what an amazing project. You have created a stunning work of art! Caroline this is such a beautiful project I can't stop looking at it. And your choice of colours is just fabulous! Oh Caroline, I love it! I'm in the middle of a quilt for my great niece at the moment and maybe I should stop start again and make it like yours, it is gorgeous! Just love the colours! This absolutely stunning, Caroline. Love the colour combo and all the beautiful details you have included. Such a gorgeous gift to receive. I love seeing this quilted set made up in different colours. This is a beautiful project, Caroline. Beautiful sampler, Caroline!! Love the colors & little spool of thread!